Description: Chione. Here is a duplicate 35mm color slide via Al Chione. Shown here is Pennsylvania Railroad engine #3750, a K-4S (4-6-2) "Pacific" built in Juniata during March of 1920, renumbered "1737" in 1956, and presently on display at the Railroad Museum of Pennsylvania in Strasburg. The photographer's name, the date, and the location are not recorded. 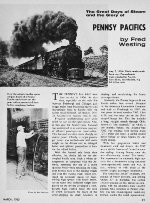 Description: Here is page one of an eight-page article by Fred Westing entitled "The Great Days of Steam and the Glory of Pennsy Pacifics." It was published originally in the March 1965 issue of "Railroad" magazine, page 21. 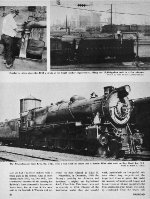 Bottom Photo: Shown here is Pennsylvania Railroad engine #3750, a K-4S (4-6-2) "Pacific" built in Juniata during 1920. This locomotive has been restored and is now on exhibit at the Railroad Museum of Pennsylvania in Strasburg, Pennsylvania. Description: RRMP. Here is an original photo that I took at the Railroad Museum of Pennsylvania in Strasburg, Pennsylvania, on 30 June 1973. 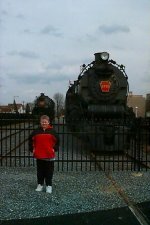 Shown here is Pennsylvania Railroad steam locomotive numbered "1737." However, its original number is "3750," as indicated on the keystone number plate on the smokebox. It is a K-4S (4-6-2) "Pacific" built in Juniata during March of 1920. Description: RRMP. Here is an original photo that I took at the Railroad Museum of Pennsylvania in Strasburg, Pennsylvania, on 30 June 1973. 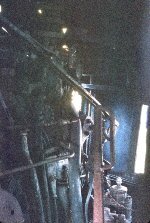 Shown here is a view of the engineer's controls in Pennsylvania Railroad steam locomotive #3750, a K-4S (4-6-2) "Pacific" built in Juniata during March of 1920. 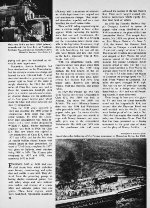 Description: In 1923, PRR 3750 pulled US President Warren Harding's funeral train. 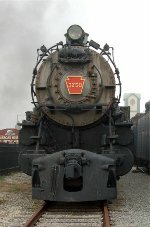 PRR 3750 is one of two surviving K4s steam locomotives, both of which were designated "The Official Steam Locomotives of the Commonwealth of Pennsylvania" in 1987. Description: The other preserved Pennsy K4 fully assembled and one display for all to see. Description: Classic Lancaster county scene. Description: The railroad museum was quite the bustle of activity today. Description: Valiant warriors fight on in the battle between them and the weather. The proud M1b and the noble K4s haven't held up too well, and these too need to be taken care of. Description: K4s 3750 still has a handsome face here at the Railroad Museum of PA.